Lory MacDonald is the art producer of four amazing Artfest shows in Ontario - Port Credit, Kingston and Toronto (which there are two shows). 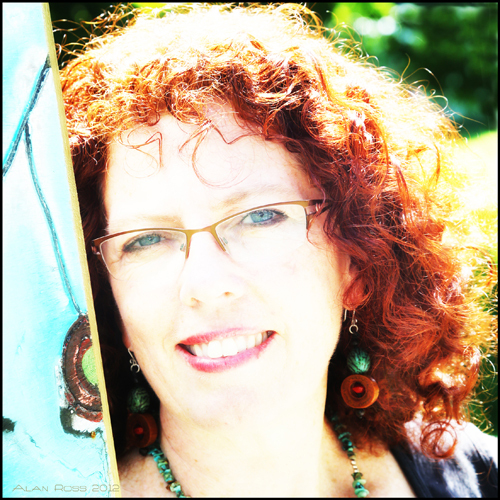 Lory is an artist, producer, arts educator and active advocate of the arts. A high energy, creative self-starter, with an artistic knack for arts of all types, Lory is continually tackling new and thought-provoking challenges. She has extensive training in fine art, graphic design, giftware product design, computer graphics, marketing and advertising, and has, for as long as she can remember, been involved in art. Lory's artwork is colourful, uplifting and energetic, while the process she uses in creating her vibrant pieces is rather complex. All of her imagery comes from either a root or base drawing, derived and inspired by nature. Using her imagination, Lory combines symbols, imagery, and patterns onto a series of drawings. Check out her website and see for yourself just how truly talented Lory really is. Her art shows have been very successful and she looks forward to each show. Her business and life mission is to share and encourage creativity in the arts which in turn enriches the lives of others. Lory's kind heart, outstanding talent, and community involvement is a driving force in her artwork and success of her Artfest shows! Posted on August 20, 2016 by Lory MacDonald and filed under Other and tagged Lory MacDonald Artfest Ontario Art Producer Event Coordinator.